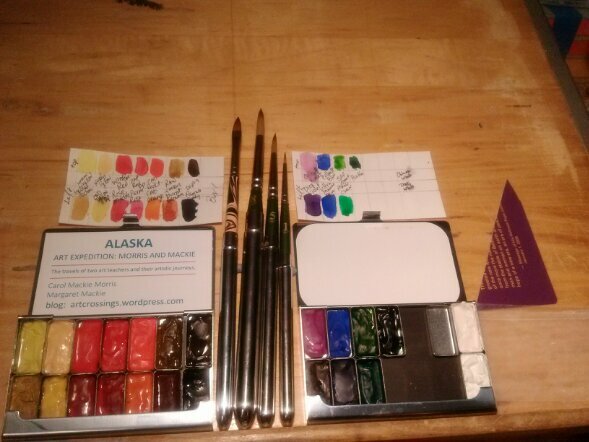 Tonight I seriously started collecting and sorting through supplies to bring.A couple of days ago, I filled the pocket watercolor palette Carol had given me as a gift. It is metal and the size of a business card holder. Carol found this .little gem at ExpeditionaryArt. It hold 14 different colors in mini tin trays and a magnet to hold them in with a white vinyl as a mixing tray. 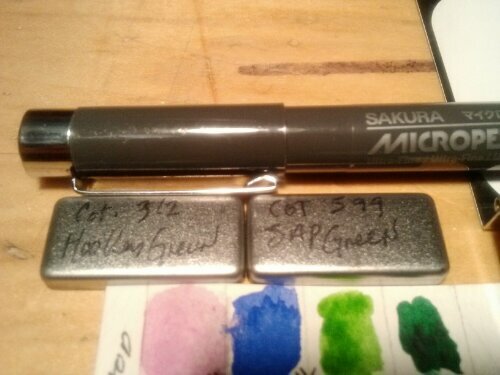 I wrote the name and number on the bottom of each tray with a Sakura microperm pens. Labeled pans, color chart too! 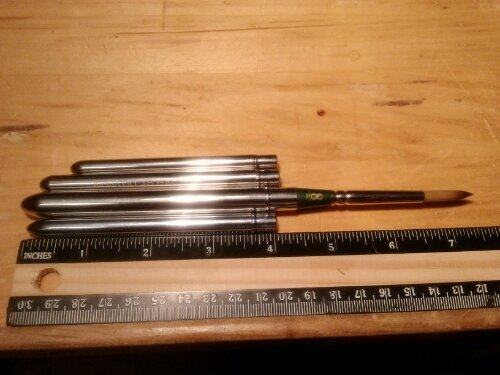 The pen claims to be permanent on metal, will see if that is true. I filled them with a combination of Windsor Newton and Cotman tube watercolors. It took about a week to dry. Some of the colors are loose and would drip. These colors were in my little wood box of tube watercolors. Until now I used two different Windsor Newton sets, small white pocket travel set with 8 colors and a larger set with 12 colors that I picked up at yard sale for $2.00. As it turns out I was only missing 2 colors from the Wrangel State Park supply list. That was a first. Then I cut watercolor paper to size and made color charts, with name. Until I can memorize the colors, .the charts are very useful. The purple triangle scrapper is a plastic credit card that is cut up. I am bringing my four travel sable watercolor brrushes, 3 from Utrect size 8,5 and 1. I treated Carol and myself to a handmade cats tounge filbert from Rosemary and Company UK . I love the faux marble handle. 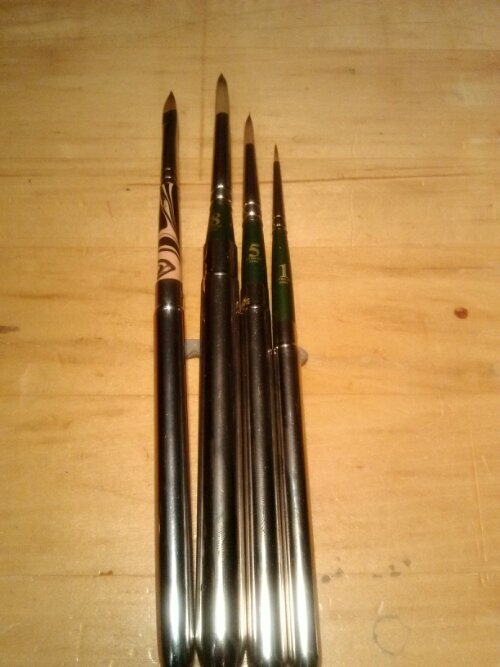 All the brushes hold water well and retain there shape. Yeah! I would not forget your camera or camera phone…no not for the pictures but if you find something that you want to draw and have to leave the area you can always work from the photograph. I am sure you thought of this I am just old and been out in the woods too long, but had to mention it.